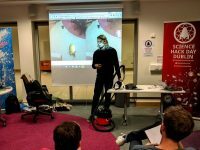 Hack Details: Using augmented reality to turn hoovering into fun! A Pacman themed game played with a hoover (which becomes Pacman in AR) collecting pac-dots (rubbish) about the room. 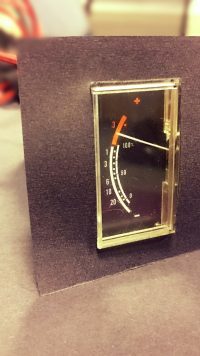 Project Description: Create a car dashboard panel, containing old-school VU meter dials to show the low-frequencies played by the subwoofer. 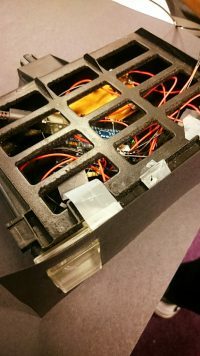 Project Description: We (almost) made a LED necklace that lights up at its northern-most point for magnetoreception superpowers like a migratory bird. Anything else? : Hardware: lilypad USB, Adafruit FLORA accelerometer/compass sensor, neopixels strip. Project Description: Breaking clocks mostly. 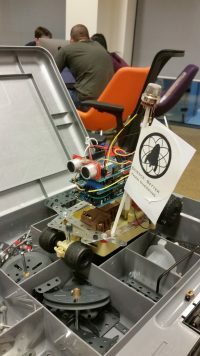 Controlling clock mechanisms using EEG input, Arduino, servo motors. Anything else? : Too. Much. Fun. Project Description: Using the clarifai api you can do two things: – Filter a set of pictures off instagram by values such as food/no-food, tasty food, and/or healthy. – Uploading your own picture the system can tell you how tasty/healthy it is, and a number of other tags that the API identifies about the picture. Project Description: The project agregates information about football matches in england from different sources. The user interfaces shows a map, with the location of football matches that fill certain criteria.